Abstract: The Súľov Conglomerates represent mass-transport deposits of the Súľov–Domaniža Basin. Their lithosomes are intercalated by claystones of late Thanetian (Zones P3 – P4), early Ypresian (Zones P5 – E2) and late Ypresian to early Lutetian (Zones E5 – E9) age. Claystone interbeds contain rich planktonic and agglutinated microfauna, implying deep-water environments of gravity-flow deposition. The basin was supplied by continental margin deposystems, and filled with submarine landslides, fault-scarp breccias, base-of-slope aprons, debris-flow lobes and distal fans of debrite and turbidite deposits. 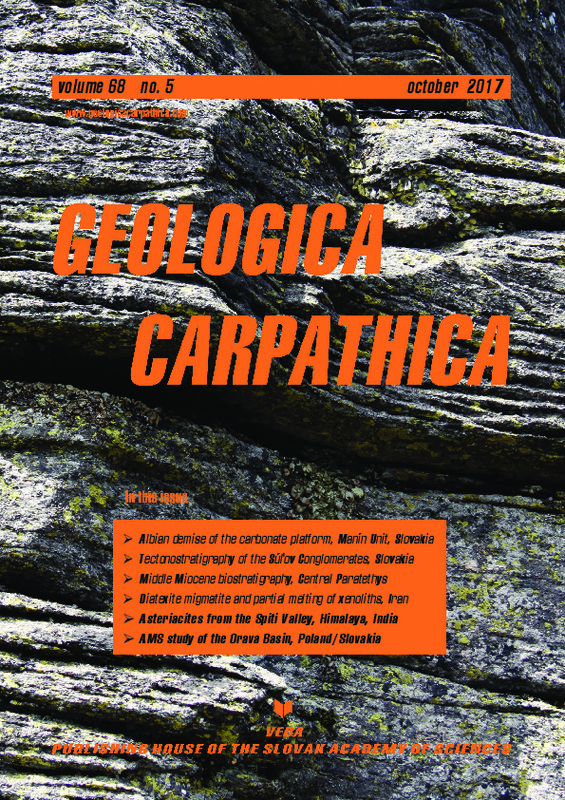 Synsedimentary tectonics of the Súľov–Domaniža Basin started in the late Thanetian – early Ypresian by normal faulting and disintegration of the orogenic wedge margin. Fault-related fissures were filled by carbonate bedrock breccias and banded crystalline calcite veins (onyxites). The subsidence accelerated during the Ypresian and early Lutetian by gravitational collapse and subcrustal tectonic erosion of the CWC plate. The basin subsided to lower bathyal up to abyssal depth along with downslope accumulation of mass-flow deposits. Tectonic inversion of the basin resulted from the Oligocene – early Miocene transpression (σ1 rotated from NW–SE to NNW–SSE), which changed to a transpressional regime during the Middle Miocene (σ1 rotated from NNE–SSW to NE–SW). Late Miocene tectonics were dominated by an extensional regime with σ3 axis in NNW–SSE orientation.